Your app users are real people. So, why treat them as one homogenous group? At the heart of your marketing, there has to be the foundation that everyone is different, and each wants an experience that fit her interests. When creating app marketing campaigns, implementing proven tactics like push and in-app messaging, you want to leverage user data to create personalized, targeted offers and content. 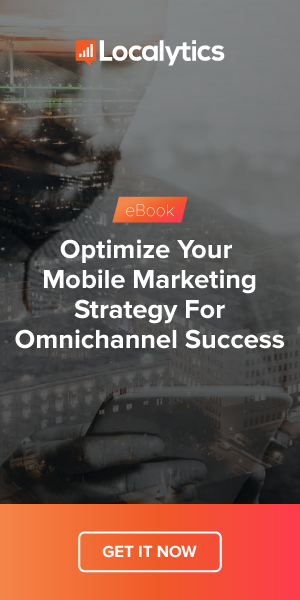 Because customizing your app messaging based on user attributes and cross-channel data will catapult your mobile marketing forward. Think of this: what good is a push message about a new product if you have absolutely no interest in buying it? If it’s not relevant to a user, she’s not going to give it a passing glance. And sending the same message to all users on the small hope that some of them will find it relevant is a poor strategy. Using Profiles, new from Localytics, you can easily gather user attributes from outside your app, including in-store and web channels, to gain a complete view of your user. With those, you have the ability to look holistically at your users and identify what they are interested in. You can start to customize (and optimize) your messaging campaigns using these eight user attributes, together or alone, to see a marked difference in your app revenue. Tried but true: customers of different ages don’t necessarily have the same interests or tastes. Some might respond to humorous, pop culture-driven copy, while others prefer to keep it simple and straightforward. The unfortunately named “digital natives” might expect to receive messages more frequently, while those who didn’t grow up with a cell phone in-hand prefer updates that are fewer and farther between. A prime eCommerce example: when it comes to your app users, women in their 20s might gravitate toward less expensive, trendier items, whereas those in their 40s are looking for staple pieces. Pro tip: this is a hypothesis, not a fact. Always test your assumptions before jumping to a conclusion. Launching a new pop-up store? Hosting a local in-store event? Conducting a huge sale? Let your users know by targeting by their location. Engage them with a well-timed push message highlighting a nearby event or remind them of a big sale nationwide by sending them directions to the store nearest them. Location is also a great attribute for determining preferences. For example, if you sell sports goods and gear in your app, chances are any user from Boston is going to be a Red Sox fan - why not send Boston users a message when new Sox jerseys arrive at the beginning of the season? This one’s easy, because few women actually want to receive app messages about men’s slacks (and vice versa). Your marketing will only hit home when it’s highlighting products specific to that user’s interest, and while it’s entirely possible that someone will purchase both men’ and women’s goods, marketing both to your entire app audience isn’t your best bet for success. Once you know your user’s gender, it’s easier to determine which products he or she will be most interested in. Another PSA: remember, everyone is different, and gender is just one aspect! Use gender in conjunction with other data, like past purchases and product screens viewed, to narrow in on actual interests, instead of letting gender alone direct your efforts. What are your users’ favorite designers? Sports teams? Shoe styles? Music artists (if you sell tickets to concerts or digital music)? Using messaging to keep users up-to-date on the latest products available within their interest categories is a great way to boost conversions. It creates an experience that feels unique to them, is informative about products they would be interested in, and cuts out the white noise of the things that aren’t interesting. Additionally, when users feel the messages they receive from your app have products relevant to them, they are not only more likely to purchase, but are more likely to become loyal users. If their shopping experience is a good one, and they trust you have what they’re looking for, your app will become one in their regular rotation. Understanding purchase behavior helps you determine individual users’ shopping habits, and if they are prime for buying. Additionally, knowing what they bought assists in deciding what other products they might be interested in browsing. Just as it’s important to know about in-app purchases, you should also be tracking in-store and online purchases per customer, so you have a complete view of their buying behavior. For example, you could send users who purchased a winter coat (either in-app or online) in September a link to view accompanying winter clothing items in your app. What this does is utilize user interests and buying preferences from other channels, so that you can encourage app usage and bring to light relevant products. If your brand runs a rewards or loyalty program in-store and online, you should absolutely include points, special offers and other rewards elements as part of your app experience. In-app purchases are rapidly becoming the largest portion of App Store revenue, and so using this attribute to pinpoint and market to loyal users via your app is the best way to capitalize on this growing behavior. If an enrolled user browses, say, three or more product screens in your app, that’s the perfect opportunity to send her an in-app message with a reminder that she has rewards points available towards a purchase. Engaging users during the browsing process, or sending a timely push reminder of points about to expire, can often prompt purchases. Similarly, you can target users who aren’t enrolled in the rewards program, but do make in-app purchases, and message them with a reminder to join. Users with a high LTV are clearly valuable users who enjoy interacting with your brand, and are more likely to purchase - so, why not send them VIP offers via app messaging? Conversely, users with a lower LTV gives you an opportunity to use personalization to create a better, long-lasting relationship. App messaging can serve as a reminder or opportunity to further interact with your brand, and, when done well, engages customers on a truly personal level. There are a number of other user attributes you can and should be using to improve your app marketing. And while each has its own inherent value, the best way to create personalized experiences is to use these attributes together. Your strongest campaigns will be ones that speak to a smaller subset of users with three or four common attributes, because while they speak to a relatively small audience, the chances of conversion events will be higher, and you can gain back volume by running a multitude of campaigns to different segments. Try mixing-and-matching to see which audiences respond to what, and use it to make your marketing smarter, and your app experience better.